Visitors to a tree farm in the hills above Claremont, California reported seeing a lone cub who was missing part of his right rear leg, soliciting food from people. No one saw his mother, nor had they seen any adult bears in the area. Although no one knew how he had lost part of his leg, it is suspected that it may have been traumatically amputated in a trap. Mack's early history is a mystery, but it almost certainly was frightening, painful and lonely. Normally, wild bear cubs stay with their mothers until they are about two years old, learning from her what to eat, how to find food, and how to recognize and avoid danger. 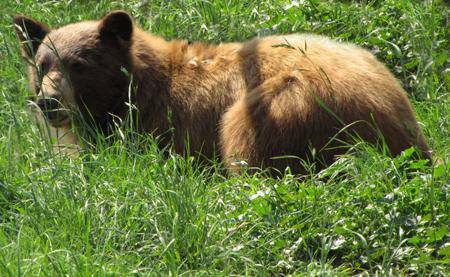 When Mack first came into contact with people last summer, he was a small cub only a few months old. Visitors to a tree farm in the hills above Claremont, California reported seeing a lone cub who was missing part of his right rear leg, soliciting food from people. No one saw his mother, nor had they seen any adult bears in the area. Although no one knew how he had lost part of his leg, it is suspected that it may have been traumatically amputated in a trap. Mack, shortly after his arrival at The Fund For Animals Wildlife Center where he had been living before coming to PAWS. Mack stopped showing up at the tree farm, but he appeared at a nearby school a few weeks later, climbing a fence and clearly wanting to be near people. On July 15th, 2015, a warden from the California Department of Fish and Wildlife went to the school and picked him up. The little orphan was taken to the Fund For Animals Wildlife Center in Ramona, California for evaluation and care. This facility takes in several orphaned black bear cubs every year and rehabilitates them for release back to the wild. When Mack arrived at the center, he weighed just 16 pounds. A veterinary examination revealed that his right hind leg had been traumatically amputated mid-tibia, but thankfully the amputation wound had healed and there was no evidence of infection. The initial plan was to care for him until he was big enough to release back to the wild, and also to assess how well he was able to cope with his disability. Within a couple of months it became abundantly clear that although Mack could get around fairly well with three legs, he had become irreversibly habituated to humans and therefore was not a good candidate for release. 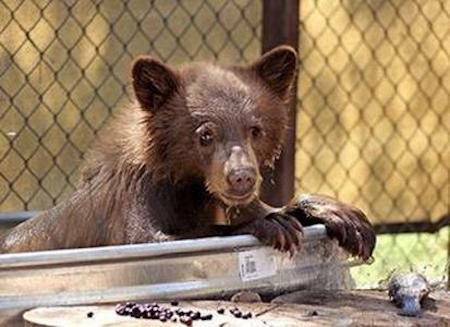 Staff and volunteers at The Fund For Animals Wildlife Center provided expert care, a healthy diet specially formulated for a growing cub, and began the search for an appropriate, permanent home for Mack. Soon after PAWS was contacted about providing sanctuary for Mack, PAWS' cofounder and director Ed Stewart and veterinarian Dr. Jackie Gai traveled to Ramona to meet Mack and learn about his special needs. We learned that Mack is very active, but needed an enclosure without too many obstacles where he might bump his amputation site. We also learned that he loves water, especially splashing in a pool. We then set about remodeling an enclosure at our Galt sanctuary that had previously been home to tigers Roy, Kim, and Claire, who recently moved to ARK 2000. Uneven ground was leveled, additional soft soil brought in, and dirt ramps were built leading to a low, grassy hill where we thought he would like to rest. 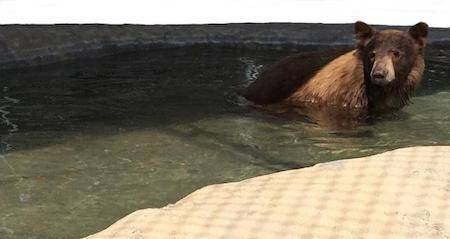 Mack arrived on August 16th, safely transported by our friend Bobbi Brink of Lions, Tigers, and Bears, a GFAS-accredited exotic animal sanctuary in Alpine, California. Mack rests in the tall grass of his habitat at our Galt sanctuary. Mack takes a dip in his pool.